It seems that messages’ confidentiality has become another point that instant messengers focus on. The emergence of Telegram, RightHere Messenger, and Stealth Messenger, which uphold message’s confidentiality at the first place, is an obvious reflection of this trend. In accordance to its name, Stealth Messenger focuses on enabling users sending confidential messages to their contacts. To support this feature, Rockliffe, Stealth Messenger’s developer, claims that the messenger uses AES/EAX technology and PBKDF password derivative function. 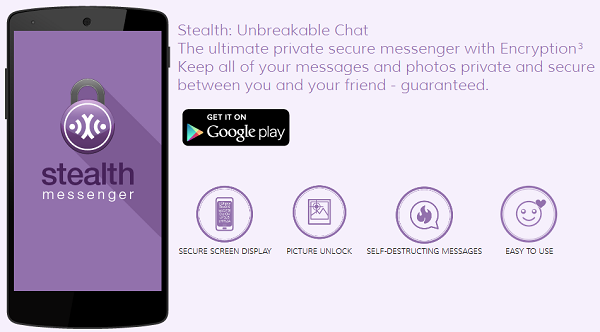 This combination indeed allows Stealth Messenger to possess series of excellent data encryption technology. Unlike any other similar messengers, users are also asked to enter their password after verifying their phone numbers. The password, which can be modified through the ‘setting’ menu, may be used to unlock the screen and access other advanced security system later. Stealth Messenger’s interface, which is dominated with white and purple, looks fresh and neat. It is also convenient enough to let users chatting with their contacts for hours. The platform really regards security and confidentiality as its first priority. The app can be auto-locked after five seconds to five minutes, depending on users’ preference. Without the right password, users can only have the unorganized contacts and chat history once they operate the app. Users may also set the default time for each and every sent message, from one minute to 24 hours. Those who are involved in a long conversation can see their previous messages getting burnt one by one should they set the Burn Messages option at minimum (1 minute only). This app restricts users screen-capturing their conversation. This minimizes the probability of the messages getting leaked even more since users will have no access to the history of their conversation. In conclusion, Stealth Messenger offers much better security and confidentiality, even compared to Telegram and its other competitors. Unfortunately, you can’t expect to have an access to change the wallpaper or theme of your messenger. However, if that’s not an issue for you and your major concern is about security and privacy, then you should try the messenger by downloading it from the Google Play Store.